This morning, the folks over at RebootIllinois have published the latest findings of a We Ask America poll on the Illinois Treasurer's race. 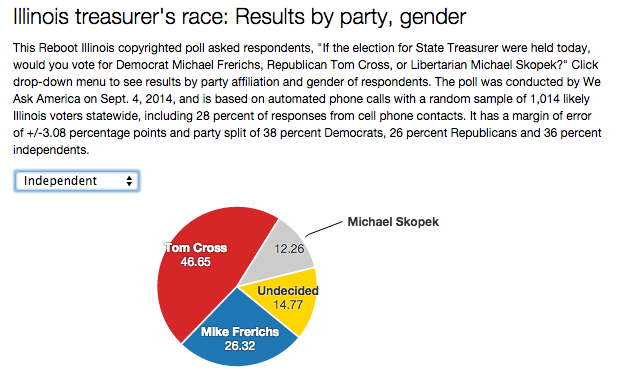 This is the 3rd in their series with all three of them - dating back to late Spring - show Republican Tom Cross ahead of his opponent Democrat Mike Frerichs. One of the most interesting facets? Tom Cross - who the Illinois Observer earlier today said was running a 'near-flawless campaign' - is way ahead with the all-important "independent voters". We'll cover the full poll in more depth in future posts, but we can't help but see this as a huge sign that trends well for the Cross campaign. Cross' lead of 20+ points with independents is a critical factor to watch. As you guys well know by now, we'll be all over this race in the final two months.